From Goodreads ~ Part cheerleader, part drill sergeant, Whitney Holcombe chronicles how to transition from the fat girl to being a healthy, confident young woman. At age fourteen, Whitney Holcombe stepped onto her bathroom scale and a number glared up at her: 230. 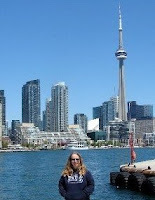 That number controlled her life until one day she went for a walk that changed everything. A little bit memoir and a whole lot of advice, 1 Year, 100 Pounds follows Whitney's journey to battle obesity, negative self-image and peer ridicule. Through following a healthy diet and exercise routine, Whitney shed the pounds without pills, trainers or surgery. And along the way, she discovered the confidence to love her body. Reviewed by experts in the fields of diet, health, and fitness, with a foreword by Dr. Joseph Colella, a leading bariatric surgeon who endorses Whitney's method of healthy weight loss over surgery, 1 Year, 100 Pounds is a personal guidebook packed with tips for making healthy food choices, easy exercises, and inspiration that empowers you to change your own life. I like reading books about getting healthy and how others have succeeded. 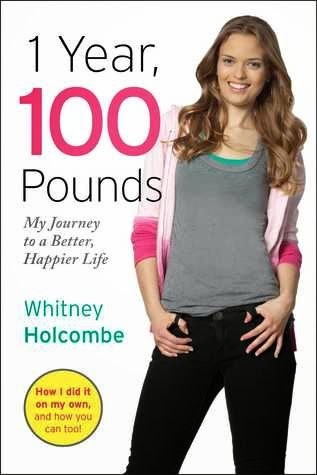 Ten years ago, Whitney was fourteen and a hundred pounds overweight. Other kids made fun of her and picked on her. One day she decided to do something about it and started with going for a walk. A year later, after incorporating healthy foods and exercise, she'd lost 100 pounds! The book begins with Whitney's story. Each chapter covers a different topic including having goals, motivation, changing habits, foods to eat and avoid (with sample food plans and recipes), exercising (with cardio and strength training examples) and having/maintaining discipline. There is even a chapter on how to deal with things like when your friends and family try to sabotage your effects, and how to handle being thinner and healthier (you'll need to buy new clothes, people who were mean to you in the past might suddenly want to be your friend, etc.). Scattered throughout the book are "Whit's Tips". There is a resource section at the end with "cool" websites to check out, fitness magazines for inspiration, workout videos and exercise equipment recommendations. This YA book is for girls age 12+ who want to lose weight sensibly and without pills, fad diets or surgery. Yay! It's written in a style and tone they will relate to. There is a lot of detail and complex concepts but it's explained in a way that it would be understandable for a YA. The author acknowledges that losing weight isn't easy and is hard work and, if I was a YA, I'd find this book motivational and encouraging. According to the book, the reasons why people are overweight is simply because they aren't eating healthy enough, are addicted to junk food and aren't physically active enough. Yes, that's true to some extent. Just because you lose weight, though, doesn't guarantee you are going to be happier and more popular, as was apparently the author's experience. There are also emotional reasons why people turn to food for comfort (abuse, family issues, etc.). It would have been nice if she'd touched more on what makes YA gain weight in the first place besides bad eating habits and laziness and give some resources for those areas too. I lost that much - I should have written a book!!! Dammit.